Last week I attended my first NSF ATE PI meeting. As a contributing member of Digital World Biology's ATE project entitled "A Bridge to Bio-Link's Future," I participated in the conference by preparing and staffing our booth in the first evening's showcase. 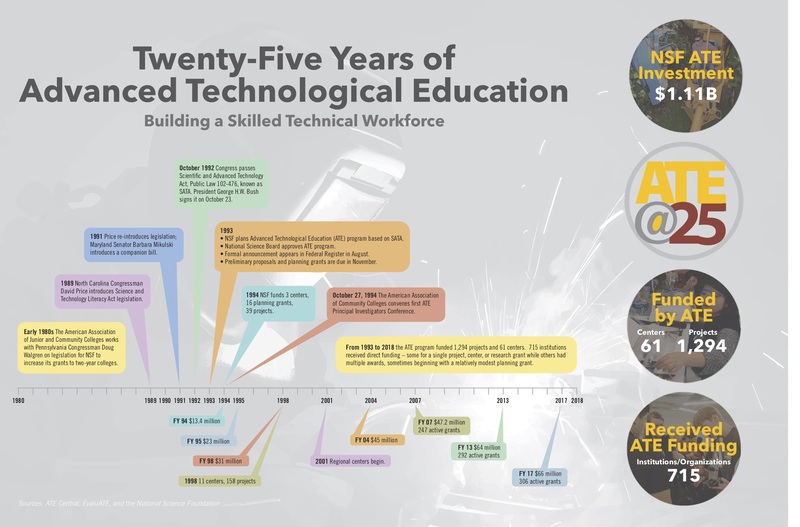 As a brief background, the NSF (National Science Foundation) ATE (Advanced Technology Eduction) program celebrated its 25th anniversary this year. ATE's mission is to support innovations in technical education at two-year colleges. These colleges, also known as community colleges, serve a vital role in education. While many know of their role as a bridge from high school to four-year (traditional) colleges, community colleges also prepare students specific jobs in industry through focused technical hands-on education. Indeed, many students with four-year degrees find that they cannot get jobs and attend community colleges to fill in missing technical gaps because their college courses did not provide "job-relevant" experiences. Older students often attend community college in response to career changes through industry shifts or personal desire. ATE’s mission, indicated on their web page, states, “With an emphasis on two-year Institutions of Higher Education (IHEs), the Advanced Technological Education (ATE) program focuses on the education of technicians for the high-technology fields that drive our nation's economy.” And, over the past 25 years ATE has supported this mission by providing over a billion dollars in funding to help community colleges meet ever changing industry needs. ATE further supports its mission trough its annual ATEPI (Principal Investigator) meeting. At this meeting ATE showcases its successes, educates new and current principle investigators, and serves as a place for the members of ATE funded projects to network, develop and support collaborations, and learn from one and other. The meeting has an amazing amount of energy and participation. As a tip-of-the-iceberg sampling, I share my a couple of my experiences. The meeting itself, is three days long. The first day has pre-conference workshops and then kicks off with plenary lecture followed by an evening showcase/dinner session. The second day includes breakfast roundtable discussions, which are followed by concurrent forum and discussion sessions, a lunch with a student poster session, more concurrent forum and discussion sessions, and closes with an afternoon showcase. The final day kicks off with breakfast roundtable discussions that are followed by more concurrent forum and discussion sessions. The meeting closes with a box lunch and networking. If you are the PI of an ATE center, you get an extra session. I've emphasized forum and discussion, because that is what these sessions are. Session leaders begin with a round of attendee introductions, follow up with a brief description of their work, and then lead a discussion. The meeting truly emphasizes collaboration, sharing, and learning. Over the three days, I attended a workshop and a presentation about marketing and branding. Innovative community college programs, regardless of field, often have difficulty recruiting students. The instructors of these programs not only need to recruit students, they also need to communicate the program's value to their college administration and funders. After all, one receives ATE funding because they are developing novel teaching methods or adapting to the emerging workforce needs of technology-driven industries in novel ways. Novel being the operative term also means that the classes, and their value, are initially unknown and, hence, needs to be communicated to students and supporters alike. ATE, recognizing this need, had several workshops on various forms of marketing - oops I meant outreach. I first attended the workshop "Lessons from Big Duck - How Branding and Marketing Strategies Can Strengthen Your ATE Work." Over the three-hour session, which was way too short of time, we learned about branding, discussed our goals, learned about the ladder of engagement, and other issues to consider in developing a marketing (did it again, outreach) plan. The other marketing outreach session I attended was on the dreaded SEO of websites; "Alt-Words, Slugs, Adwords, Oh My! - Keys to Maximizing Your Digital Marketing. SEO (Search Engine Optimization) is about how you write and use terms that can help people find you on the web through search. 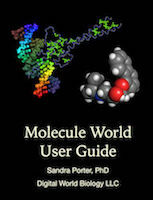 All of Digital World Biology's websites, DWBio.com, Bio-Link.org, and Biotech-Careers.org have SEO tools running under the hood. So, when one writes a blog on Bio-Link.org, for example, and adds some tags to it, those tags will be included the blog's metadata to help if appear higher in search rankings. In case you didn't notice, I'm SEOing right now. Dr. Christine Darden gave the opening keynote. She was one of NASA’s “computers” during the space race of the early sixties, and was included in the book "Hidden Figures" by Margot Lee Shetterly. Her talk focused on her work in understanding super sonic transport and ways to reduce sonic booms. Through Dr. Darden's presentation, she described the many obstacles that she overcame as an African American woman; it was inspiring. Following the plenary talk, Digital World Biology had its showcase. During ATE showcases, funded projects and ATE centers have booth displays much like an exhibit hall. Digital World Biology showcased the Bio-Link.org and Biotech-Careers.org websites along with our work with Shoreline Community College on Immuno-Bioinformatics, and our Bioinformatics for Instructors course taught at Austin Community College. We also played some Amino Fish and Amino Rummy. I also participated in two breakfast roundtables. While the food was meh, the discussions were great. One of the roundtables was on data science. If you ask ten people what data science is you're likely to get 11 opinions. That is due to the fact that data science involves many aspects of data generation, storage, analysis, and knowledge development. The term data is general, but they kinds of data that are collected are specific to a particular field (domain) of use or study. In bioinformatics - my area of specialty - I often hear from colleagues that students from two-year colleges would not have the needed education to do many of the bioinformatics jobs that need to be filled. This roundtable confirmed my suspicion that the need for advanced degrees is simply not true. Granted, to be a domain expert in bioinformatics requires extensive experience and education in biology, statistics, and computer use/programing, but many kinds of work can be done by students with community college degrees and (or) certificates, especially in the areas of data production, data cleaning, and reformatting. Moreover, as community colleges focus on technical hands-on education students can receive experiences that are more concentrated on the actual nuts and bolts of being a data practitioner. At the data science roundtable we also learned about the Oceans of Data Institute. In 2016, The Oceans of Data Institute convened a panel of experts across multiple industries from biotech, to financial services, to law enforcement, to health, and others to outline the "Profile of the Data Practitioner." The result of this work is available from their website. It's a simple four page report that includes a very good table that describes the general duties and tasks of the data practitioner. My other activities included a roundtable on mobile app development, forums and discussions on "Increasing the Student Biotech Pipeline - From Recruitment to Employment," "Meeting Demands for Skilled Employees with Competency-Based Education," and "ATE Biotechnology at 25: Impacts, Challenges, and the Future." Those and other keynotes, showcases, and networking made for a very full and action packed three days. I'm already looking forward to year's meeting.